Apple offers an application called iTunes to install on a Mac/PC. This application provides a functionality called File Sharing for supporting the transfer of files between an iOS device and a computer. When I talk about File Sharing I talk about the tab APPS in iTunes and not about music, photos, or other stuff. You should always keep in mind that regular backups of your device are indispensable but there is no way to extract a single file from this backup for restoring it on your device. If you loose a file you must have a copy elsewhere to restore it, or, you must restore your complete device and loose all your data changed after the last backup. For some other files the data exchange is also supported without the use of iTunes, e.g. the Photo Stream where photos are transferred automatically to iCloud and from there transferred to all other devices using the same Apple ID. To understand File Sharing we first take a glimpse on the iOS filesystem. Specific folders are assigned for each app on your device. An app only can work with these folders and not with folders of another app. This is what Apple calls ‘The sandbox mode‘ and it’s designed for security reasons. An iOS app’s interactions with the filesystem are limited mostly to the directories within the app’s sandbox. Because it is in a sandbox an app is generally prohibited from accessing or creating files outside its home directory. One exception from this rule is when an app uses public system interfaces to access things such as the user’s contacts. This design prohibits direct access from your computer to files on your device, e.g. you cannot copy a PDF which was generated by the app Scanner Pro after scanning a document. However, a user must have access to some files on his iOS device to further use them on the computer. This functionality is provided by iTunes File Sharing. Launch iTunes on your computer. Select your iOS device from the Devices section of iTunes. If you do not see the File Sharing section shown in the image below, your iOS device does not have any apps that support File Sharing. Under the File Sharing section, you’ll find a list of apps currently installed on your iOS device that support File Sharing. Select an app to view a list of the files associated with that app on your iOS device. Click the Add… button, locate the file or files you want to copy from your computer, and click Choose. The selected files will be copied to the app on your iOS device immediately. Select only files that are supported by the iOS device app. Refer to the iOS app’s documentation to determine which file formats are supported. you also delete all files associated with it. That’s a consequence of the above explained iOS file system. To avoid losing files on your iOS device associated with the app, back up and copy shared files to your computer frequently, and especially prior to deleting the application from your iOS device. To do this, select the files shown in the Documents section of the specific app and copy them to a local folder on your computer. The folder should be named with the app’s name. It depends on the app’s functionalities which way is best to avoid data loss. Some apps with iCloud support, such as Apple’s iWork suite, save files as a local copy on your device and in iCloud to push them to other devices. With other apps not supporting iCloud but supporting ‘Send by E-Mail’ you may send a file to your own E-Mail address and use it as a backup. What is syncing compared to file sharing? Syncing (with your computer) means that changes to files you made on your iOS device are transferred to your computer’s local hard drive when you connect your device via USB to your computer, open iTunes, select your device and start Syncing. The Documents directory is the primary location to save user and application related content. This directory and its subdirectories, are backed up when a user does a sync with iTunes. This directory is also the repository for iTunes file sharing content. The Documents Inbox is primarily used when an application such as Apple’s Mail app calls an app with a request to open a specific file type. The file passed to the application (from the Mail Inbox) is stored in the Documents Inbox directory. As the name implies, the tmp directory is available for files that are used only while your application is running. The content in the tmp directory is not backed up when a device is synced with iTunes. The Library directory is intended for content that is not user generated. The content in the Library directory is backed up when a device is synced with iTunes, with one exception, there is a Caches directory that is not backed up. You might think that if you sync you already have a copy of your data on your computer. That’s true, but not in all cases. 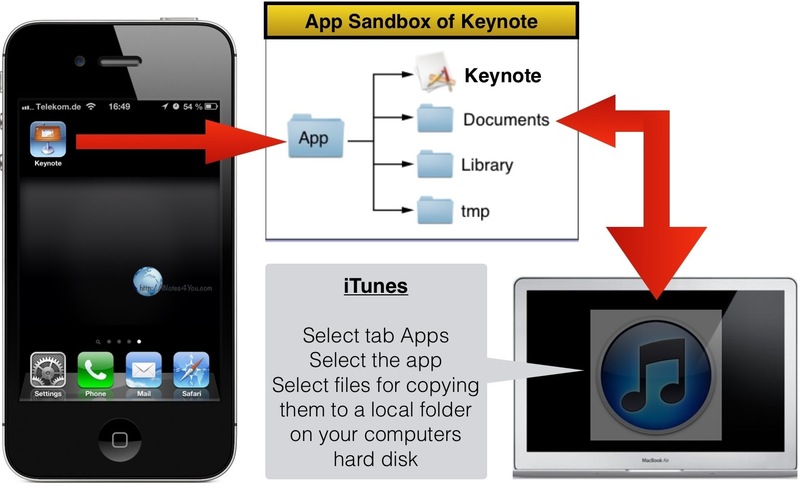 Files of the app Discount Spreadsheet (Luminant Software) are updated in the File Sharing section of iTunes every time and immediately after you connect your device via USB. Files of Apple’s iWork suite on the other hand are possibly not displayed. The reason than is that they never were copied to iTunes. As I figured out data of some apps have to manually transferred to iTunes. There is no general rule which app presents its data in the File Sharing section of iTunes. If you don’t see any files after selecting an app, open the app on your iOS device and try to find an option (like File Sharing, e.g. app 1Password) or a command (like ‘Copy to iTunes’, e.g. apps of iWork suite) to transfer files to iTunes. For Apple’s iWork suite keep in mind that turning off syncing with iCloud stops syncing across all of your other devices and iWork files are only stored locally on your iOS device. You should never set the option ‘Use iCloud’ to OFF (Settings – options for Keynote, Numbers, Pages) if you work on more than one device. If you possibly turn it to ON later you will get a lot of messages regarding different versions of your documents and you have decide for each single document what to do (Keep it from this or that device or both). There are apps supporting file sharing, other apps which do not, apps syncing with iCloud or not, apps providing backup functionalities, and others for which iTunes File Sharing is mandatory. 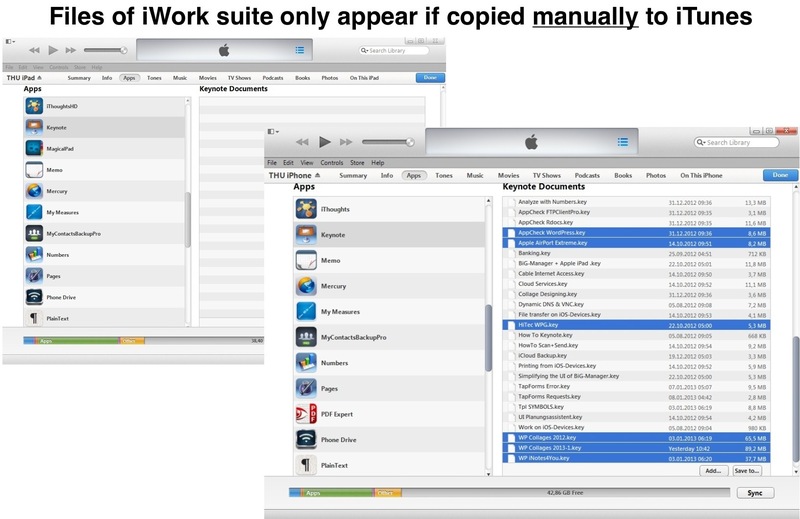 For Apple’s own iWork suite the situation is a bit confusing. 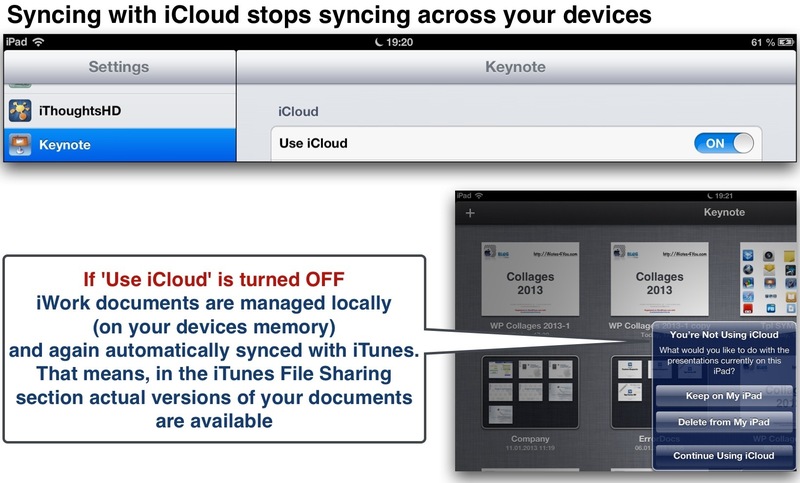 If you use iCloud the documents are synced with iCloud and across all your other devices but not backed up in iTunes. And unfortunately there is no option to copy them to iTunes in total. You may think that this blog article is a bit confusing with all its If’s and Then’s and Else’s and But’s. But I don’t bare the blame. If there is no consistent concept there is no consistent description. and are also available as local copies if you currently don’t have an internet connection. But keep in mind that if you delete a file on one device it’s immediately deleted across all other devices using the same Apple ID. There is an extra level of copies of files which can be separately restored whatever happens on iCloud or on your device. For iWork you may use the available WebDAV connection to a cloud provider (e.g. iDriveSync). If you install the related client application on your computer you will also have access from your computer to those files without using file sharing of iTunes. Use ‘Copy to WebDAV’ every time you worked on a single document.